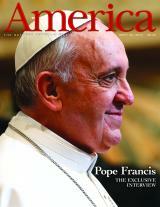 Everyone’s talking about Pope Francis and his recent interview in America, the American [Roman] Catholic weekly magazine published here in New York by the Jesuits. We wanted to provide you a link to the interview–you’ve seen the pull quotes, now go read the whole thing. It’s definitely worth a close look. The Christoph Keller, Jr. Library subscribes to a number of denominational journals and newspapers, not only the Episcopal/Anglican titles you already knew we had. Our Roman Catholic holdings include America, the National Catholic Reporter, L’Osservatore Romano, Catholic Biblical Quarterly, and Conscience, among others. For some of these, our patrons can find fulltext online access through the catalog–and others are available here in print. Come on over and browse our periodicals stacks to find the very latest news on the denomination you’re interested in…and for more information about how to become a library patron, check out this link! Welcome to the Easter 2013 Term!